Why I sponsored a bike race - Brandon Crichton, Personal Real Estate Corp.
Having witnessed and participated with the Devo Cycling Program on the North Shore previously, it always impressed me on how eager the young kids were to reach their fitness and race goals. It was impressive to hear them chat about their future goals, and what they wanted to achieve in life. It reminded me WAY TOO MUCH about my younger days as a bike racer and the dreams I had, and the dreams I achieved. My goal in supporting The Seymour Challenge is to begin a process of simply giving back and watching these kids progress in their cycling (and after-cycling) careers. 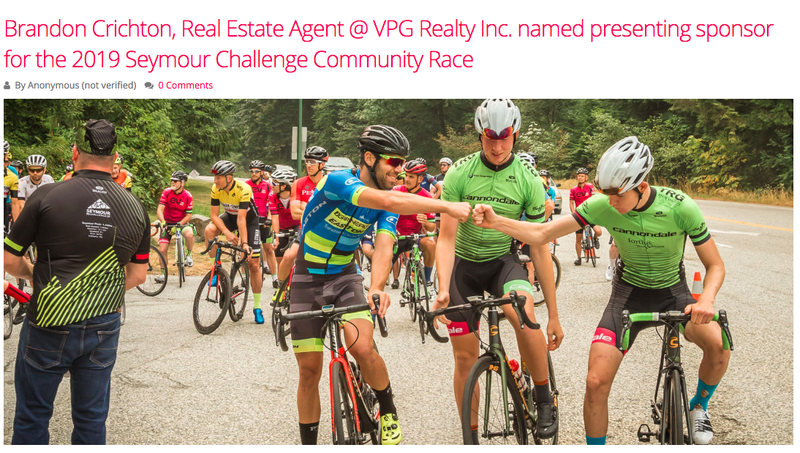 Escape Velocity Cycling club is proud to announce Brandon Crichton, Real Estate Agent @ VPG Realty Inc. as the presenting sponsor of the 2019 Seymour Challenge Community Race scheduled for August 18, 2019 (date to be confirmed). The race is in it’s 53rd year and it’s 39th running and was reborn last year embracing a more family/community centred approach for the event. As a first-hand witness to the Devo program and a past professional cyclist who has represented Canada on the world-stage, Brandon’s desire to give-back and support the local cycling community was conditioned in him at an early age by his father. As a father himself now, he hopes this program will one-day bring his son the same joy it brought him on a bicycle. Supporting a program that enables kids to not only pedal faster and smarter but gain valuable life skills that will assist them in their later careers is the ultimate win-win for me” said Brandon. Brandon is a local real estate agent in North Vancouver and a portion of all his sales will go directly to supporting the next generation of cyclists. Escape Velocity Cycling Club is for riders of all levels and abilities who share a commitment to improving their performance. For many years we have been the primary organizer of cycling racing in the Lower Mainland and we proudly support of the premier youth cycling development programs in the country.